Before You Go: Sea Kayaking Espiritu Santo Island Basecamp 7 Days | OARS. We’ve taken some of our clients’ favorite activities and combined them into one GREAT trip! Snorkel with sea lions and among tropical fish, kayak the turquoise waters of the Sea of Cortez, release sea turtle hatchlings into the Pacific, hike among giant cactus or try your hand at fishing. If we’re able, we’ll snorkel with whale sharks* (January start dates only, weather permitting and dependent on the presence of the whale sharks). Upon arrival to the famous Espiritu Santo Island National Park you’ll settle into our beautiful luxury base camp on a white sand beach caressed by turquoise waters with volcanic cliffs and towering cactus as back drop. Camp is comprised of large walk-in canvas tents, each complete with 2 cots, pads and pillows for a restful nights sleep. Without having to move camp daily our flexible itinerary facilitates a variety of activities for a variety of interests. Our professional guides will provide sea kayaking excursions tailored to abilities from beginner to advanced paddlers. Motorized skiffs skillfully operated by our experienced captains will transport folks to and from the island and accompany the trip. Having skiffs accompany your trip allows you to participate in activities not possible if traveling by kayak alone. We can motor to snorkeling “hot spots” including a sea lion rookery where we snorkel among these graceful creatures enjoying their playful and curious nature first hand. As we kayak or travel by boat along the shores of the island, it’s common to see manta rays and dolphins leaping from the sea’s surface. To complete this exciting tour we’ll take you to Todos Santos on the Pacific side of the Baja Peninsula where you’ll participate in releasing tiny sea turtle hatchlings into the ocean as part of a sea turtle conservation project. Don’t miss this opportunity to combine all these spectacular wildlife events and other activities while camping in comfort at our luxury base camp only available in December and January! *On trips that begin in January (only) we’ll attempt to visit the whale shark feeding area and possibly snorkel alongside these gentle giants (weather permitting). If you are on a trip that starts in December and would like to snorkel with whale sharks, we suggest you plan an extra day in La Paz for arranging this activity. Please keep in mind this activity is weather dependent with calm seas necessary and at times the whale sharks may not be present. Although we do our best to adhere to the above itinerary, it is subject to change for reasons beyond our control including wildlife unpredictability, weather and port closures. Upon the chance the port is closed due to high winds and we can not get a group to the island on departure day we will provide a land based activity for this day. 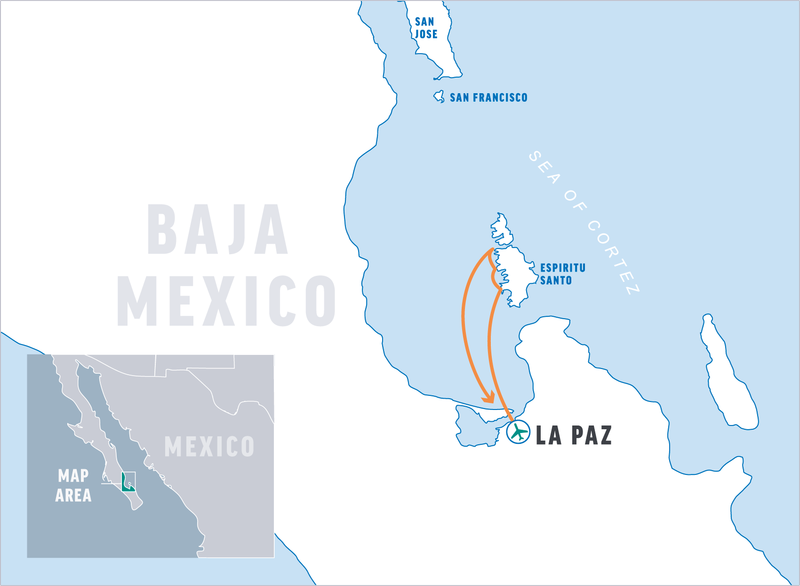 Fly directly to La Paz or to San Jose del Cabo and make your way to La Paz. Upon arrival in La Paz take taxi to our hotel. This evening you’re on your own to explore La Paz and dine at one of its many fine restaurants. Join us for an early breakfast and orientation with our guides at the hotel’s cafe. Any rental items requested can be picked-up and paid for afterward. We then transfer by motorized boat to the island of Espiritu Santo (approximately 2 hours). Lunch will be served upon arrival at camp. After lunch we will go through a camp and kayak orientation, then depart for a short paddle, snorkel or swim. Enjoy kayaking, snorkeling, fishing and relaxing along the shores of the enchanted island of Espiritu Santo. Guided kayak excursions of 1-8 miles are offered daily. Our basecamp is located in a protected bay along the west side of Espiritu Santo Island. Other guided activities include hiking into canyons draped with fig trees, fishing for sea bass or skiff excursions to nearby snorkeling “hot spots” including a sea lion rookery where we join these graceful creatures, swimming alongside them while enjoying their playful and curious nature first hand. We try to include an opportunity to snorkel with whale sharks on trips starting in January. The day in which this activity is offered will be determined during the trip, based on weather & conditions and availability of space on the tours. After an early lunch, we transfer back to La Paz by motorized boat, check-in to the hotel and have time for a stroll along the malecon (waterfront boardwalk) or an early-day siesta. In the afternoon we head to Todos Santos on the Pacific coast (about a 1.5-hour drive) for the sea turtle release at sunset and return to La Paz in the evening. Dinner in La Paz is on your own, as you’re free to explore town and the many options available. Transfer to the La Paz airport or to the Malecon for ground transport to the San Jose del Cabo Airport. The ride to the airport in La Paz takes approximately 20 minutes; the ride to San Jose del Cabo takes about 3 hours. You should arrive at the airport 2 hours prior to your flight departure time. Please reserve equipment rentals on your trip registration form. Payment will be collected in La Paz prior to your trip departure, cash is appreciated (U.S. dollars are welcome). Single supplements must be prepaid. Single hotel room & single tent supplement: Please note: if you are a single traveler and willing to share we will waive the single supplement if we’re able to pair you with another traveler of the same gender. Rental items can be collected and paid for the morning of itinerary day 2. Please plan ahead and have US dollars for the rental cost. You should make arrangements to arrive in La Paz, Mexico on or before day 1 of your trip. Final information with details regarding your hotel and a voucher for your taxi will be sent approximately two weeks before your trip. The evening of day 1 is free for you to explore La Paz on your own and dine at one of its many fine restaurants. There are no direct flights from North America to La Paz (LAP). One option is to fly to San Jose del Cabo (SJD) and take a 3 hour shuttle to La Paz. The other option is to connect through Mexico City (MEX). Numerous airlines fly direct between North American cities and the airport in Cabo (Cabo is also referred to as Cabo San Lucas, Los Cabos and San Jose del Cabo–where the airport is actually located). Airlines include Alaska, American, Continental, Frontier, Delta, Virgin America, WestJet, United and US Air. Airlines offering flights from Mexico City to La Paz include Aeromexico, Volaris and Interjet. Shared shuttle service: Ecobaja Tours is an inexpensive, reliable and efficient shuttle service. They operate several daily shuttles between the Cabo airport and the La Paz malecon, a short cab ride to the hotel. The cost is about $35/person one-way and takes approximately 3 hours. Private shuttle service: OARS can assist with arranging a private shuttle between the Cabo airport and La Paz. Prices are based on the number of passengers. Local bus service: If you are already in the area, you can take the public Aguila bus to La Paz from local bus stations. Please allow plenty of time and flexibility. Flights: Service into La Paz is offered by Aereo Calafia. However, flights depart from Cabo San Lucas (CSL), not San Jose del Cabo (SJD). Car Rentals: It is possible to rent a car and drive to La Paz. Several major car rental agencies are represented in Cabo and La Paz, along with some local ones. You will overnight in La Paz on the last night of your trip, itinerary day 6. You may depart at any time the following day. This trip includes hotel accommodation for the nights of itinerary day 1 and day 6. If you plan to arrive early or stay late, please contact our office if you would like assistance in booking pre- or post-trip accommodation. If you decide to fly into San Jose del Cabo, you can stay near the airport or travel to Cabo San Lucas, a resort town at the tip of the Baja Peninsula, approximately 25 miles south of San Jose del Cabo. If you don’t have a passport, apply for one immediately because the process can be lengthy. If you do have a passport, find it and check the expiration date to see that it is valid for at least the duration of your planned stay in Mexico. Make a photocopy of the photo page of your passport and carry it separately from your passport. It is also a good idea to leave a copy with your emergency contact at home. If your passport is lost or stolen, a photocopy will help the local consulate speed up authorization for replacement. Also check your passport for blank pages. If you do not have at least two blank pages in your passport, we recommend that you apply to have extra pages added. Do not pack your passport in your checked luggage. You may be asked for your papers at various times during the trip. If you are carrying a customs form, please keep it in a safe place at all times (we do not recommend carrying it in the passport because you often must submit the passport at hotels, where reception clerks can easily lose the form). Visas are not required for US citizens to enter Mexico. For non-US citizens please check with the consulate. Upon arrival in Mexico you will go through customs. Your airline will give you a tourist card to complete while on your flight. Be sure that you have signed both copies of this form. Please have this document and your passport available for the customs officer. Keep your copy of this form in a safe place; you will need it to exit Mexico and return to the U.S.
Minors traveling with one parent or a guardian MUST have a notarized letter of consent from the other/both parents to take the minor out of the country. Our base camp is situated on a beach along the west coast of Espiritu Santo Island. A large dome tent is set up by our staff and used for cooking. Meals are taken outside, while enjoying the spectacular views. An additional shade tarp provides protected outdoor seating and relief from the noon day sun. Large, canvas walk-in tents with cots and pads are provided based on double occupancy or you may choose to sleep on the beach under the starry sky. Our staff does the cooking, and you are welcome to lend a hand at any time. It’s a great way to practice your Spanish! We serve a combination of the best of American and Mexican tradition prepared with local fresh ingredients. Barbecued chicken, fresh fish Vera Cruz style, grilled steak tacos accompanied by guacamole and a variety of Mexican salsas, plus fresh soups and salads prepared for lunch are just a few examples of our tasty menu. The skiffs allow us to bring large blocks of ice to store fresh produce and chill canned beverages you bring on the trip. Each evening, we serve a cocktail and appetizer for “happy hour” so you can enjoy the spectacular Baja sunset while sipping an ice cold Margarita! We carry sufficient drinking water along with us to provide for your needs throughout the trip. Water jugs are accessible in camp, at lunch time and before hikes for filling personal water bottles. Fresh drinking water is also available at your hotel. We recommend when you are out and about on your own that you drink bottled water. Our fleet of kayaks on each trip is comprised of approximately 2/3 double kayaks and 1/3 single kayaks. Most are made by SEDA products of fiberglass construction and all are equipped with rudders. We do have a few rotomolded plastic boats in our fleet for variety in seat construction as some of our guests find the plastic boat seats more comfortable. Based upon your experience, size and group composition your guide will help determine what kayak you will paddle, double or single, fiberglass or plastic. We encourage the group to rotate kayak seats so everyone has a chance to paddle to their desire. Lightweight Swift and Nimbus paddles, PFD’s (personal flotation device), nylon spray skirts, paddle floats and bilge pumps are all provided on our expeditions. Seats are molded plastic and you may want to bring a pad. If you are under 5’3″ tall, we recommend you bring a seat pad that adds a couple inches of height while sitting in the kayak seat, as this may improve your paddling experience. If you are over 6’2″and/or over 200 pounds, please let us know in advance and we will arrange a kayak with a large cockpit. We offer exclusive use of a single kayak on most trips for a fee of $50 per kayak. You must be fit and experienced in kayaking and screened in advance by our office. Fishing on our kayak trips is done by trolling behind a motorized skiff (two rods at a time) from one to two hours before breakfast on certain mornings or from your kayak. If you want to fish, please come prepared with your own lures. We can supply a rod & reel, but you may prefer your own. Medium to small minnow-type, sinking lures are suggested such as a Rebel jointed Fastrac or mid-size Rapala Magnums (4.5 to 5 inches or 9-12cm in length). Suggested colors include: blue/silver, black/silver, black/gold, green mackerel/gold or blue mackerel/silver. The best fishing season in Baja is summer through fall. Therefore the best months for fishing on our sea kayak trips are October and November. Typical catches during these months include tuna, dorado and sea bass. During winter months sierra mackerel are commonly caught. Spring provides varied options for catching a variety of fish depending on where you are and what lures you use. Be sure you print your license and carry it with you. While the idea of a camping trip is appealing to most people, many are inhibited or reluctant because of modesty or uncertainty. To minimize our impacts, we carry out all solid human waste and use a portable toilet system. It is basically a small self-contained toilet basin that even uses water to flush. It is placed in a secluded spot a discrete distance from tent sites at each camp and is available from the time you arrive until you depart. Toilet paper and a convenient hand-washing station are provided. Bathing (with a biodegradable soap that lathers in salt water) is available daily in the sea. Dr. Bonner’s does NOT lather in salt water. Campsuds, Joy or Dawn work well and are biodegradable. Fresh water will be available for a quick rinse from a sun shower to complete the process. Mexico’s electrical system is the same as in the US and uses the same type of plugs. You will only have access to electricity when you are in La Paz. In addition to your regular camera case, we recommend using extra protection such as zip-lock plastic bags, a waterproof camera case or a small day dry bag in the kayak, with padding. Water and dust can be a problem—so clean your camera every night with tissue, a brush and lens paper. We strongly recommend you take out a rider on your homeowner’s policy to cover your camera—especially if it’s fine equipment. If you are planning to bring a digital camera, don’t forget extra media cards, batteries, etc. Disposable waterproof and panorama cameras are also a fun option. Many of our guests travel with their smartphone even though there is limited or no cell service. On a trip like this, there is always the risk of water damage to smartphones and other electronic devices, even when they are stowed in a dry bag. If you intend to take your phone with you on the trip, consider investing in a small, waterproof container just for your phone. On most trips, we are able to provide charging for your electronics on our skiffs with a standard power strip (for use only in the daytime), and/or at camp in the common area using our solar panels or generators. You may want to consider bringing your own personal sources of power, but it isn’t necessary. We advise cell phones be kept on airplane mode to conserve battery life as there isn’t reliable cell reception. Once you are on the trip there is limited communication with the “outside world.” Cell phone service is not always available. Our guides are able to use cell phones in many places for emergency service and in other situations communicate by marine band radio on the boats. If you have someone that needs to contact you about an emergency at home, they should call our office (800-346-6277) and we will relay the message to you. Keep in mind the message may not reach you immediately. For your family at home you should define for them what you consider an emergency and provide them with instructions to call our office in the event one occurs during your vacation. ATM’s are available but can be unreliable. Many shops and restaurants accept US dollars but this can vary depending on where you are. Once in La Paz, you may want some pesos for purchases around town. You can change your dollars into pesos at the airport and banks (closed on weekends and holidays). Please note, no more than US$300 can be changed into pesos per month at the banks. The amount of cash you bring is subject to how much you plan to spend on meals (note those not included), services in town, shopping and for tipping. We recommend bringing a minimum of at least $300 cash. Please keep in mind you might want to bring twice that much if you plan to generously tip your guides, as well as spend money on equipment rentals at our office, meals, drinks and souvenirs in town. Travelers checks are not recommended as they are difficult to cash. Although we do not require any immunizations to participate, it is important that you be up-to-date on several standard immunizations and that you check with your physician prior to departure. The CDC also is a good resource for recommendations pertaining to international travel immunizations. Folks who are susceptible to motion sickness are encouraged to bring prophylaxis. This may be applicable during the motorized water crossing to & from the island, or for the driver to & from Todos Santos. You may want to check one week prior to your trip for an up-to-date weather forecast. We recommend the following website: www.wunderground.com for weather in Baja. Spring and fall are the most ideal times for enjoying the Sea of Cortez. The strong northerly winds blow longest and strongest from late November through early March so spring and fall trips are characterized by calmer, warmer days. Fall trips (Oct & Nov) offer warm and clear waters for great snorkeling and little chance of strong winds. An added attraction is the opportunity to observe the Baja desert in bloom following the rainy season in August and September. Winter trips (Dec & Jan) tend to be cooler with more chance of wind. Daytime highs may be in the 70s but with the wind it will feel cooler. Spring trips (Mar, Apr & May) offer warmer waters with warm calm days being common. As an added bonus on spring trips many cetaceans migrate into the Sea of Cortez at this time and sightings may include blue, fin, sperm and humpback whales. 1. Ability to remain balanced while seated inside the cockpit of a touring kayak. 2. Wear a Type III Coast Guard-approved personal floatation device (maximum chest size of 56 inches). Wearing leg straps may be required to ensure proper fit. 3. Ability to independently board and disembark a touring kayak four to ten times each day. This may require stepping into the boat, sitting down on the low seat, and then maneuvering your legs into a comfortable position. 5. Ability to independently swim 100 yards in flat water while wearing a PFD. This includes being an active participant in your own rescue, including having the ability to (a) keep your airway passages sealed while underwater, and regain control of your breathing when being submitted to repeated submersion under waves or currents; (b) orient yourself to new “in-river” surroundings; (c) reposition yourself in the water to different swimming positions; (d) swim aggressively to a boat or to shore; (e) receive a rescue rope, paddle, or human assistance, and possibly let go of the same; (f) get out from under an overturned boat. 6. Ability to follow both verbal and non-verbal instructions given by guides in all situations, including during stressful or dangerous situations, and to effectively communicate with guides and other guests. 7. Ability to carry personal dry bags and other personal gear (as heavy as 20-30 pounds) uphill from the boats to your camping location and back the next morning, independently, or with the assistance of a friend or family member. (This only applies on multi-day trips). 8. Ability to manage all personal care independently, or with the assistance of a friend or family member. 9. If taking prescription medications, have the ability to maintain proper dosage by medicating independently, or with the assistance of a friend or family member. 10. Ability to remain adequately fed, hydrated, and properly dressed so as to avoid environmental injuries such as hypothermia, heat related illness, sunburn and frostbite. During the day – Start with a swimsuit and/or swim trunks and synthetic or merino wool shirt as a base layer if temperatures are cool. Additional layers for sun protection or insulation can be added and subtracted depending on the weather and temperature. In camp – When the weather is warm, lightweight cotton pants/skirt or shorts and shirt make great camp wear. Anytime the forecast calls for cool evenings and cold nights, a dry set of long underwear is the perfect base layer under long pants and a fleece sweater. During the day – The best all-around choice is a sport sandal with a heel strap or an amphibious sport shoe. Sand and small pebbles will get into whatever shoe you wear. Sand in aqua shoes and semi-closed water shoes is difficult to remove and your feet remain wet inside, so most of us prefer open water/river sandals with no siding. When worn loosely, sand and pebbles are easily removed by rinsing your feet in the sea. Find professional-grade options made by Chaco®, the official footwear sponsor of OARS guides. In camp—We recommend footwear with a sturdy sole due to risk of kicking a rock buried in the sand or stepping on a sharp stick. Athletic shoes or light hikers you bring for hiking can double as your camp shoes. Flip flops or slip-on sandals or OK, but provide less protection. During the day—Wide-brimmed hats are a good choice for sun protection. You may prefer a ball cap to wear. In camp—When the weather is cool, you’ll want a beanie-style hat to wear in camp. They are the perfect remedy for bed-head as you rise from your sleeping bag to secure your morning cup of coffee or tea, or for retaining warmth in the evening hours after the sun sets. Synthetic or merino wool long underwear is a must-have on winter (Dec-early Mar) kayak trips. It can be worn under shorts, rain gear, T-shirts, etc., then stripped off when the chill of the morning has worn off. It keeps you warm even if it’s wet (which can happen easily), dries quickly, and it’s compact enough to be stuffed into your small waterproof bag or daypack after you take it off. It can be layered under your waterproof rain jacket and pants. Be aware that cotton items, once wet, do not insulate; only synthetic and wool materials will keep you warm during cool, wet weather. Raingear protects you from rain, wind and the splash while kayaking. It is one of the essential items that all passengers should have no matter what time of year you are traveling. Look for jacket and pants that are 100% waterproof, not just water resistant. A hooded jacket is recommended as well as secure closures around your head, neck and wrists. Do not bring a rain poncho as it cannot be worn under your PFD. Protecting yourself from the sun should be taken very seriously. A hat, sunscreen, lip balm and sunglasses are a must. In many cases, a long-sleeve shirt is the best method for preventing sunburn on your upper body. Light-weight long pants may also be appropriate to protect your legs when not in the kayak. Be sure to bring a good hat that offers full coverage, such as a wide-brimmed hat. Please consider using reef friendly sunscreen (sunscreens containing oxybenzone, Octinoxate, or octocrylene kill corals in even tiny doses). Please check the ingredients and respect Baja’s corals. Bugs and mosquitoes vary depending on location and time of year. Due to the dry desert nature of Baja, it does not tend to be buggy. However, some years have sufficient precipitation to support mosquitoes, gnats and no-see-ums. It’s a good idea to come prepared with insect repellent just in case. You can bring your own sleeping bag or you can rent one from us. Our walk-in canvas tents include a cot with pad and pillow. ☐ Insect repellent: Mosquitoes are generally not a problem, but it’s always best to be prepared. ☐ Swimsuits: 1-2; 2-piece suits recommended for women. Tankinis are a great option. ☐ Sarong or sundress: useful for sun protection, evaporative cooling, changing clothes, etc. Pack light! We prefer not to overload our boats with lots of excess baggage. For example, bring a small to mid-sized duffel (approximately 14″x14″x24″) for clothing and personal items. If bringing your own sleeping gear bring another duffel of similar size for your sleeping bag, pad and pillow OR you can combine them into one larger duffel (approximately 18″x18″x35″). Plus you will want to bring a small day pack or dry bag for extra clothing, water bottle, sunscreen and camera to have with you daily. If you bring your own snorkel gear and wetsuit, that may be yet another bag you have while on the trip. Personal gear you do not want to bring on the trip may be left at the hotel in La Paz. We recommend that you leave your valuables at home. While on the trip you can store your passport, wallet and other items in your duffel or at the hotel in La Paz. Tipping is optional, but appreciated by our staff. If you are wondering how much to tip, you may consider that we operate in a service industry with a host of behind-the-scenes contributors in addition to the guides on your trip. In general, we suggest a gratuity based on 10 – 15% of the trip cost. It is customary for gratuities to be given to the Trip Leader, who will then distribute appropriately amongst all the guides and support staff. If you plan to tip, remember to have cash – either US dollars or Mexican Pesos. A $500/person deposit is required at time of reservation. The balance is due 90 days prior to departure. Everyone is required to sign a standard liability release form before the trip, acknowledging awareness that there are inherent risks associated with the trip. Due to the nature of the activities, a condition of your participation is that you will sign this form and return it to our office before the trip begins. Anyone who refuses to sign the form will not be allowed to participate, and consistent with OARS. International cancellation policy, there will be no refund of the trip fees at that time. O.A.R.S. International, Inc., Sea & Adventures, Inc. and cooperating agencies act only in the capacity of agent for the participants in all matters relating to transportation and/or all other related travel services, and assume no responsibility however caused for injury, loss or damage to person or property in connection with any service, including but not limited to that resulting directly or indirectly from acts of God, detention, annoyance, delays, and expenses arising from quarantine, strikes, theft, pilferage, force majeure, failure of any means of conveyance to arrive or depart as scheduled, civil disturbances, government restrictions or regulations, and discrepancies or change in transit over which they have no control. Reasonable changes in itinerary may be made where deemed advisable for the comfort and well-being of the participants, including cancellation due to water fluctuation, insufficient bookings (this trip requires a minimum of 4 guests), and other factors. There is risk in sea kayaking, particularly during rough water conditions. Sea kayaks, skiffs, or other boats do capsize. You could be swept overboard. Your guide will make every attempt to assist, but you must be strong and agile enough to “self-help” without further endangering yourself or others. We reserve the right not to accept passengers weighing more than 260 pounds or with a waist/chest size exceeding 56 inches. We are experienced at accommodating people with various disabilities. Please give us an opportunity to make you feel welcome. However, we need to discuss any special requirements ahead of time. We may decide, at any time, to exclude any person or group for any reason we feel is related to the safety of our trips. On advancement of deposit the depositor agrees to be bound by the above recited terms and conditions. Prices and itinerary are subject to change without notice.